May-Russell points out that this approach applies equally to rough vacuum pump equipment, citing reports that by replacing its original installation with an Atlas Copco GHS VSD+ vacuum system, an industry leader in plastics thermoforming saved an estimated £70 000 per annum. On the question of what factors made 2016 such a great year for business, May-Russell feels that despite the effect of some exchange rate-led pre-Brexit price increases from suppliers, local industry was more active with new builds and factory extensions requiring pipework and new plant. What’s more, cost-conscious buyers were looking at the whole picture - the total cost of ownership, starting with air audits and leak detection, before seeking the latest technology to provide the optimum solution. Air Kraft’s outlook for 2017 is very positive. Optimism is high for a performance similar to 2016. The company has enjoyed consistent growth, doubling its sales target in the last two years, and has recently expanded into adjacent premises for extra storage. In the pursuit of business opportunities from some of the Midlands major players in the aerospace and transport sectors, the provision of energy-saving solutions continues to be the company’s prime objective and the principal contribution to its continuing success. Air Kraft has been providing compressed air and fluid power solutions since 1993. Operating as a Premier Distributor since 2012, the company offers the supply and installation of a full range of energy-saving stationary oil-lubricated and oil-free air compressors, nitrogen generators and vacuum pumps. With major emphasis on Atlas Copco’s GA 5 kW – 90 kW rotary screw compressors, together with air quality equipment and pipework installations, Air Kraft provides essential customer services such as preventative maintenance, repairs and reconditioning, air audits, leak detection and air quality testing. 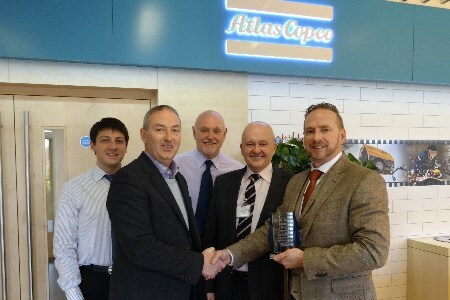 Atlas Copco’s Distributor of the Year award is a significant achievement within its nationwide network because it is not based solely on local sales target criteria. It is assessed on key performance indicators for the distributor’s whole business and the spread of growth versus that of the previous year.